Joel Bregman, MD, won't soon forget his 50-something patient with autism, a verbal, functional college graduate who held a full-time job as a delivery driver, but whose obsessive compulsive symptoms led him to store spoiled food in his car trunk and eat it. The man was nearly in renal failure because of dehydration. Although that was an extreme case, Dr. Bregman, who has for three years presented a workshop on caring for adults with autism at ACP's Internal Medicine annual meeting, said that medical crises are not uncommon because of the social and communication impairments that characterize the disorder. The case also illustrates an important aspect of caring for adults with autism: Patients may be unaware of or unlikely to disclose potentially harmful behaviors and many have a high threshold for pain, so they may not report discomfort. Recent estimates indicate that autism afflicts an estimated 1 in 150 children, which means that most internists will encounter individuals in this patient population. A decade ago, the frequency was thought to be 1 in 500. There is no standard for when the transition from pediatrics to adult primary care occurs, noted Dr. Rosof, former chair of ACP's Board of Regents, and community practices and resources may be the dictating factors. In females it may be the beginning of the menstrual cycle, but it's more up in the air with males. The transition probably should occur with high-functioning individuals at least by college age. Common red flags include object fixation, a lack of spontaneity or emotional reciprocity, inability to hold a job despite high intelligence, or a patient who doesn't present until symptoms are very painful. Only 10% of adults with forms of high-functioning autism (unimpaired intellectual ability) are able to live independently or to hold down a full-time job. That causes stress, which may exacerbate the patients' difficulties with functioning in society as they move from adolescence into adulthood. “About 50% of youth with high-functioning autism develop symptoms of depression, mood disorders or anxiety, and that carries over into the adult population,” said May-Lynn Andresen, RN, administrative director of the Fay J. Lindner Center for Autism, and who also has a child on the autism spectrum. Referral to or co-management with a specially trained psychologist or psychiatrist is in order, Drs. Bregman and Rosof agreed. Cognitive behavioral therapy has proven very beneficial in helping children and adults with autism improve their social and communication skills, and deal with their sensory sensitivities. Even in diagnosed patients, collaboration may be needed to deal with issues such as nonverbal cues or extreme sensory sensitivity. When internists care for patients with autism, several considerations come into play. The first is how best to prepare for the patient's visit. Pre-visit preparation can mean the difference between a challenging encounter and one that goes relatively smoothly, Ms. Andresen advised. Gathering in advance all available information about the patient's cognitive functioning, verbal ability and medical history is a must. Extensive medical histories are often available for individuals who live in staffed group homes, Dr. Bregman said. A pre-visit conversation with the patient's caregiver about what to expect in terms of behavior and sensory sensitivities that may affect patients' functioning is extremely helpful, Ms. Andresen added. The second consideration is figuring out how to diagnose or discern medical problems in individuals whose social, communicative and, possibly, cognitive functions are impaired, and whose hypersensitivity to stimuli may cause them to become agitated or withdrawn in the exam-room setting. It's also important to find out how the patient best communicates and then structure the visit accordingly, Dr. Bregman urged. Visual aids can be very helpful, for example, because even verbal, highly intelligent people with autism may not be able to follow a multi-step instruction when it's given verbally. Because of their language deficits or verbal processing impairment, autistic patients may be more visual or spatial. “Physicians should plan to be clear and brief in their comments and requests. And joking around doesn't work with these patients,” he cautioned. Alison Morton-Cooper, PhD, author of Health Care and the Autism Spectrum: A Guide for Health Professionals, Parents and Carers, and parent of a college-aged son with high-functioning autism, noted that physicians should communicate their intentions to the patient clearly and directly—telling the patient what will happen next, and why—and maintain a clear sense of structure throughout the visit. Adults with autism tend to develop the same range of medical problems other patients do—hypertension, coronary artery disease and diabetes, for example, and at roughly the same rate, Dr. Rosof noted. What's most important when evaluating patients with autism, Dr. Bregman suggested, is to understand that acute medical problems are often exhibited in an atypical manner even in high-functioning patients. The patient with a headache, earache or belly pain, for example, may become very irritable or agitated, or possibly self-injurious. “Don't assume that because the patient becomes aggressive it's an emotional problem. With any acute change in behavior, it's important to think about an acute medical problem,” he explained. The evidence does show, however, that patients with autism may experience atypically latent development of seizure disorders, which afflict 20% to 30% of people with an autism-spectrum diagnosis. “The onset is very atypical for seizure disorders. If there is congenital brain pathology, you would expect the seizures to occur early in life,” Dr. Bregman said. “However, in autism, onset is typically early to mid-adolescence.” As such, he added, internists should be aware that even their patients with high-functioning autism are at risk for seizure disorders. Adapt. The pediatric sequence is best for the physical exam, Dr. Bregman advised. “Start with the least invasive first, and leave the most invasive for last. That means eyes, ears, nose and throat usually are last,” he said. Answer. “The internist may need to be prepared to answer questions—sometimes over and over until understanding is reached.” Conversely, patients with Asperger's (severe social impairments and repeated behavior and activities without the language problems of autism) “may already have read all the literature and may be ready to argue cogently about the different treatment choices,” she added. Be specific. Vague questions may confuse the often literal, concrete-thinking autistic adult. 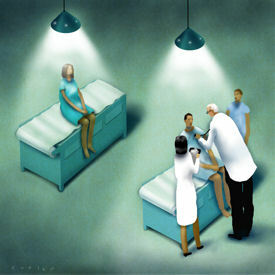 For example, Dr. Rosof explained, the internist shouldn't say “How do you feel?” or “Why are you here?” A better sequence would be: “Does it hurt?” or “Is there pain?” A trusted individual may be needed in the exam room, he added, to help the internist decipher facial expressions, body language or other nonverbal cues. Comfort. Urge the accompanying individual to have the patient bring along a comforting item, whether it's a stuffed animal or a cherished book, Ms. Morton-Cooper advised. Make the waiting room environment as quiet and unthreatening as feasible. Also, learn about patients' interests in advance, and then discuss them with the individual early on in the visit, Dr. Rosof recommended. That approach often increases the patient's comfort zone and helps to build trust. Refer. When psychotropic medications are indicated or considered, consult with a psychiatrist who has experience with autism, Dr. Bregman urged. “Polypharmacy is a major problem in this population.” It is not uncommon to see an adult with autism who is on six different psychotropic drugs—for symptoms ranging from hyperactivity and obsessive-compulsive tendencies to sleep disorders, he said. Ms. Andresen adds when beginning a new medication, it is best to start with the lowest possible dose and use small incremental changes, as individuals with autism spectrum disorders typically are sensitive responders to medication dose changes. Autism Society of America. The local chapter and the state office of mental retardation are good starting places from a practical perspective. Fay J. Lindner Center for Autism & Developmental Disorders at North Shore-Long Island Jewish Health System. For help with clinical issues and medical management, the brochures Your Next Patient Has Autism and Autism Toolkit for Healthcare Professionals are invaluable. Autism Speaks. A three-year old organization for awareness, fundraising, science, and advocacy. Most patients with autism are accompanied by another individual—a parent, sibling or residential-facility caregiver—when they come in for an initial visit. May-Lynn Andresen, RN, administrative director of the Fay J. Lindner Center for Autism at North Shore LIJ Health System in Beth Page, N.Y., and mother of an autistic child, created the following questionnaire to help internists and office personnel prepare for the visit. It can be adapted to each office's needs. Describe any special sensory needs, i.e. : touch, sound, light, etc. How has he/she reacted in the past to (this setting) physical exam appointments? Does he/she have any phobias/fears? What triggers his/her anxiety? How do you know when he/she is getting anxious? What does he/she do? Does he/she enjoy speaking with others? What are his/her favorite interests/topics/tv shows/videos? Describe a recent positive experience. Does he/she learn best through use of visuals i.e. : pictures or schedules? Does he/she have any rituals or routines; enjoy counting? Please provide a preference list the patient can enjoy in this setting, (and) include items that you brought from the home setting.